Due to our extreme weather conditions, excessive ground movement will eventually destroy all types of pavement. In our sixty years, rarely if ever do we find adequate subsoils or bases under deteriorated pavement. Patching or overlaying older driveways will result in annual expensive costs. We can show you how those costs can be applied into low monthly payments on a brand new driveway. 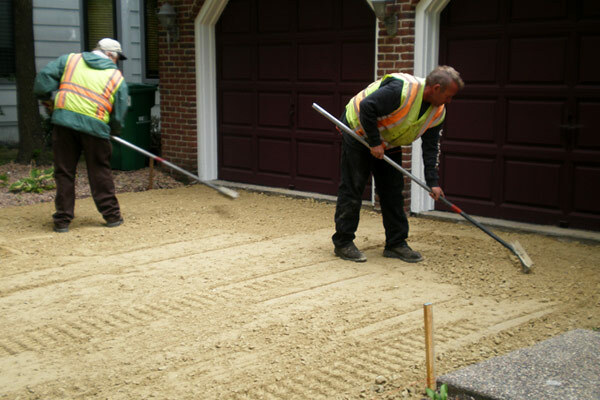 Newer or structurally sound driveways can be expanded, or repaired when damaged. Our experienced estimators, thru visual inspections, Can advise you on your options available. We are licensed in all metro cities and will do all the footwork and permit requirements for you. Including: Driveways, garage floors, steps, sidewalks, and patios. Why do we seal asphalt driveways? Sealer does nothing structurally for the driveway. What sealer does is keep your drive looking new, makes it easier to clean and clear snow, and it protects from surface down. Sealer – we use the best commercial grade asphalt based sealer available. The sealer is blended with select materials to remain flexible and water repellant with exceptional bonding abilities. We add micro fine sand for traction and durability. To achieve over 60 years in residential driveway construction, we have always believed in quality first with exceptional communication and commitment towards our customers. We have proven ourselves year after year, every thing we do is explained up front so you will understand every step in the process. We are proud of our work and we always back it up. We support and are very proud of our A+ rating at the better business bureau. Since 06/24/1951 we have been standing behind our product and it shows. I wanted to formally let you know how pleased I am with the work Asphalt Driveway Company did for me in replacing my driveway. Your company did everything they said they would do, when you said you would do it, and all in a professional manner. Simply put, you've exceeded my expectations and i thank you. The new driveway looks great, functions perfectly, and we had a wonderful working relationship with everyone we dealt with at Asphalt Driveway Company. The people were very professional, had the work completed on time, and cleaned up everything to our satisfaction. I would highly recommend Asphalt Driveway Company to anyone needing a new driveway. Thank You. I want to commend your crews on the excellent job they did on the driveway. Both, the prep crew and the final paving crew, were all professional, polite, courteous, knowledgeable, and detail oriented. It was a real pleasure having them work on my driveway. And, much to my surprise, both crews cleaned up extremely well, after their jobs were complete. It was a welcome relief to have such an effort from a work crew.